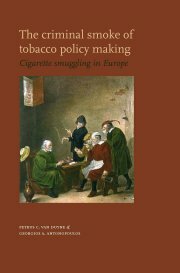 While the authorities were worrying about the ‘globalisation of organisedcrime’, mainly concerning drugs and human trafficking, a new crime-marketdeveloped: the illegal cigarette trade. As had happened so often in the historyof law enforcement, it was fully created by the authorities themselves by interferingin basic capitalist relationships of customers reacting to prices andtraders to profits. To discourage consumers’ tobacco consumption, the taxeswere heavily increased, creating the illegal profit margin for those who succeeded to dodge this ‘price-wedge’. It took some time before the EU-authorities discovered that a new market for organising criminals has come into being, allof their own making. The illegal cigarette market is extensive, cross-border, serving more customersthan the whole drug market, and still has attracted the attention of only a handfulexpert researchers who explored this criminal phenomenon in the last decade. In order to make their innovating research reports, spread over variousother books and professional journals, better available, this special edition of the Cross-border Crime Colloquium brings their publications together. They provide insight into the working of this crime-market: the traffickers, the waysthey organise, the customers, the law enforcement reactions and all this togetherthe shaping of a new crime-market, which is still unfolding dynamically.